Your resource for the best chocolates. I live here, so I better have a page about chocolate in Boulder. A friend and I agree to swap chocolates from our respective cities so I took a tour of my favorite chocolate stops in Boulder. First stop Whole Foods. Whole Foods is great because they are everywhere now, and they tend to stock both national and regional chocolates. Some even have nice international chocolates, like the one in Boulder. 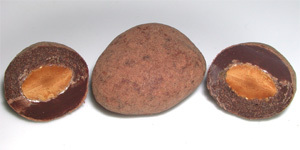 From Spain they carry Piedras de Chocolate - cocoa dusted, dark chocolate covered, toasted Largueta almonds. I hear these almonds are great by themselves, but they are even better covered in chocolate. Your only choice is how you eat them. You can bite into them, toss a whole one in your mouth and chew it, or, my favorite, toss it in your mouth and let all the chocolate melt away before you crunch the almond. Next stop is next door at Vitamin Cottage for chocolate bars. I go there because the bars are usually less expensive than they are at Whole Paycheck. Boulder has been home to two chocolate bar companies, Chocolove and Dagoba. Dagoba left for Oregon, but I still consider them a local chocolate bar. Dagoba specializes in organic and varietal chocolates. One of their cool tricks is infusing flavors into the chocolate bar itself as well as adding other ingredients. They have many great bars, but for this trip I chose the lime because it is unique and tasty. Dark Chocolate is infused with lime and macadamia nuts are added. At 59% cacoa content it is a mild enough dark chocolate to please a wide range of palates. Chocolove still calls Boulder home and proclaims their bars are made in Boulder with Belgian chocolate. I rarely get anything besides the Ginger Crystallized in Dark Chocolate. (I must ask that guy why, besides for graphics reasons, it is not Crystallized Ginger.) 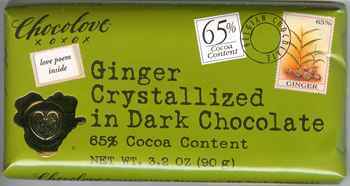 This bar features crispy nibbles of crystallized ginger in 65% dark chocolate. This bar also features one of the best shapes for a chocolate bar. Each bar is divided into 18 squares, each of which has a smoothly rounded top. If you want to bite, great! If you want to pop a square in your mouth and let it melt, great! I tend to let it melt a little and then bite. I like the snap of the chocolate and the flavor and texture of the little ginger pieces. Another fun feature of these bars are the love poems inside teh wrapper of each bar. The rest of the falvors are good, but I find the ginger really, really good. My next tour stop was the Rocky Mountain Chocolate Factory shop on the Pearl Street Mall. This cozy shop has a wide variety of sweets, both chocolate and otherwise. Check out the caramel dippeds marshmallows, for example. I go there for one reason - Chocolate dipped Nutter Butters! Currently priced at 95 cents each I find them to be quite a tasty bargain. Half of the cookie is dipped in milk chocolate, and the other half in white chocolate. I am still deciding which half I prefer. So far I am leaning toward the white chocolate dipped half. 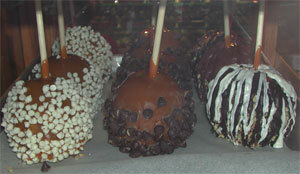 They are also famous for over-the-top candy apples. Caramel, chocolate, chips, you name it, adorn these monsters. Kids and adults will both be pleased. My last stop was the soon-to-move Belgian Chocolate Shop at 1634 Walnut Street. They are moving towards the Pearl Street Mall soon. This is our main traditional chocolate shop. It follows the Belgian tradition of neatly displaying the chocolates on trays in a case. The person taking your order wears a white glove and stacks your selections neatly on a tray before packing them. The whole experience is delicious. You can also find bulk bags of Callebaut chocolate chips, and one and 11 pounds blocks of chocolate. They also do wine tastings where they try and pair four chocolates with four local wines. If you love chocolate you can plan to spend a while here. At Belvedere you will find a large selection of traditional Belgian style chocolates. I almost always ignore items based on hazelnut paste. While it can be quite tasty, I can rarely tell the difference among brands, and hence I do not find them distinctive. I prefer chocolates with tastes or techniques I cannot find other places. In this shop I always go for the Caramel Butterflies and the Tea chocolate. The Caramel Butterfly comes in white, milk, and dark versions. I think their dark is a bit of a clash with the sweet and I usually aim for white or milk chocolate versions. Slightly bitter caramels seem to go better with dark chocolates, but having written it down, I will have to pay more attention now and see if that is true. It is just a gut feeling for now. The Tea is a dark ganache infused with tea and set into a dark shell. For me is a creamy square of dark chocolate heaven. I am sure there are other chocolates in town I have missed, in particular the six chocolate assortment that is on the dessert menu at Frasca. I hope to try that next week and will keep you posted on what I learn.